On December 21 2015, the International Association of Designers VATIKAM will be two years old! That is why we decided to renew certain elements of the Association’s visual identity and to hold a contest among our designers for selecting the best layout from the proposed. Contest participants: anyone willing registered on the website of the International association VATIKAM. Contest period: 01.11.2015 to 30.11.2015. To take part in the contest, one has to create a new portfolio on the VATIKAM website titled “Visual identity for VATIKAM” and host in it 3 to 10 work samples. The portfolio may hold work samples in .PNG and .JPG formats. The contest winner will have to provide ready layouts to the Administration of the VATIKAM project in .CDR and .PDF formats. We require layouts for a diploma, a certificate and a letterhead. We annually update the layout of the diploma used throughout the year and awarded to winners and participants of our contests. The amazing designer Zlata Poltavets (St. Petersburg, Russia) prepared two previous baroque-styled diploma layouts. From now forth, we would like to keep the solemn and official look of the diploma when modernizing it. Diploma sheet size: 301 х 214 mm. Top part: Center – VATIKAM logo, below it – DIPLOMA. Bottom part: President of the International Association of Designers K. Saakyan Paris, France 2016. 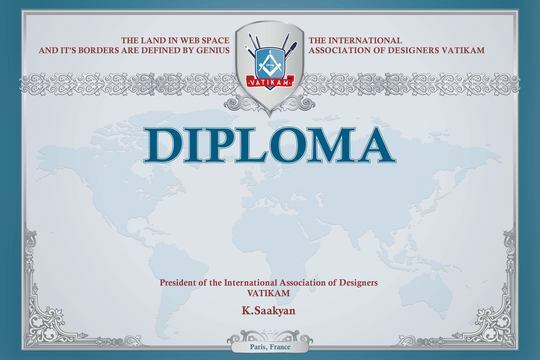 The design of the certificate is introduced for the first time; it is important that it be in harmony with the style of the diploma while not duplicating it. Certificate sheet size: 301 х 214 mm. Color scheme: at designer’s discretion. Top part: Center – VATIKAM logo, below it – CERTIFICATE. 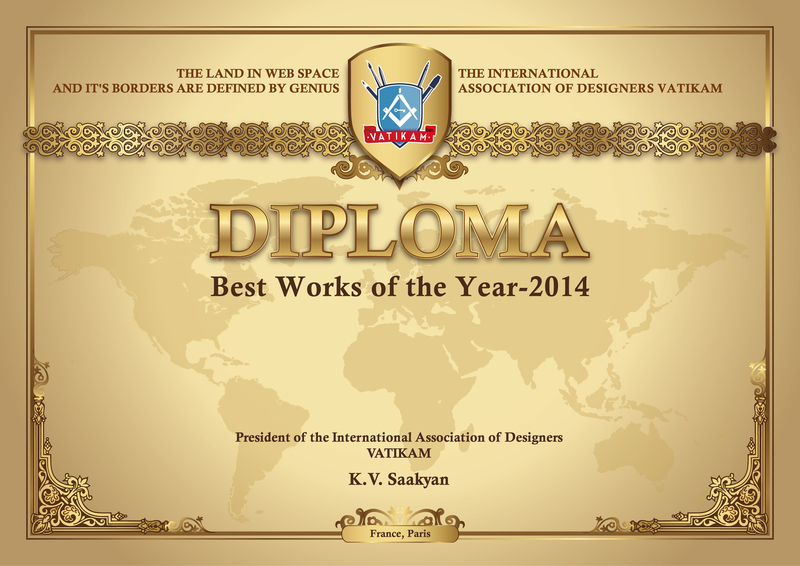 Bottom part: President of the International Association of Designers K. Saakyan Paris, France. Top part: center – VATIKAM logo. Other elements – at designer’s discretion. A participant with the most votes given to their portfolio will receive as a prize an opportunity to host a free-of-charge individual exhibition of their works on the VATIKAM website. The winner will be chosen by a joint decision of the President of the Association, the panel of judges and the project Administration. The winner will receive a payment for the layout design amounting to 100 euros after finalization and acceptance of the ready layout by the ordering party.